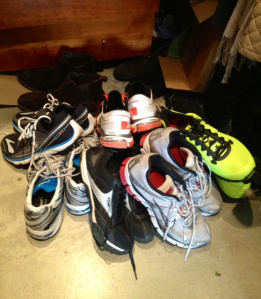 Every new pair of running shoes smells faintly of hope. It’s part of the bargain, I guess. Put your money down, make your dreams come true. But after a while you stop noticing. Hope simply becomes your partner, your mate, your significant other, part of what drives you. But stop running and those same shoes begin to give off a whiff of despair, staring back from cold desolation of the closet or jumbled together in that useless pile by the door. It’s an odd transformation, but it holds. That’s as much wisdom as I can offer after thirty-plus years in the game.